Wow, big cinnamon bear, and at Sheepeater. I saw would for some reason not expect a black bear there. I saw one just past Sheepeater a couple years ago, a cinnamon. Thus far we’ve carried on a pretty good streak of fulfilling my clients’ wildlife goals on this tour. We’ve produced a lot of “firsts” and some thrilling moments already this week. Still, I wasn’t sure of our chances of landing our next goal: baby moose. The sighting late the previous evening had proven the rumors to be true: there was a moose with a new calf somewhere in the northeast. But whether they’d be in one of the open meadows in the area was unpredictable. Everything else is dense forest and the roads have little to no shoulder and infrequent pullouts. Leaving at 5:15, we made our way along the north road toward the Lamar and beyond. The drive was pretty smooth aside from a couple slowdowns for bison, so we ended up along the stretch where the moose had been seen Tuesday. 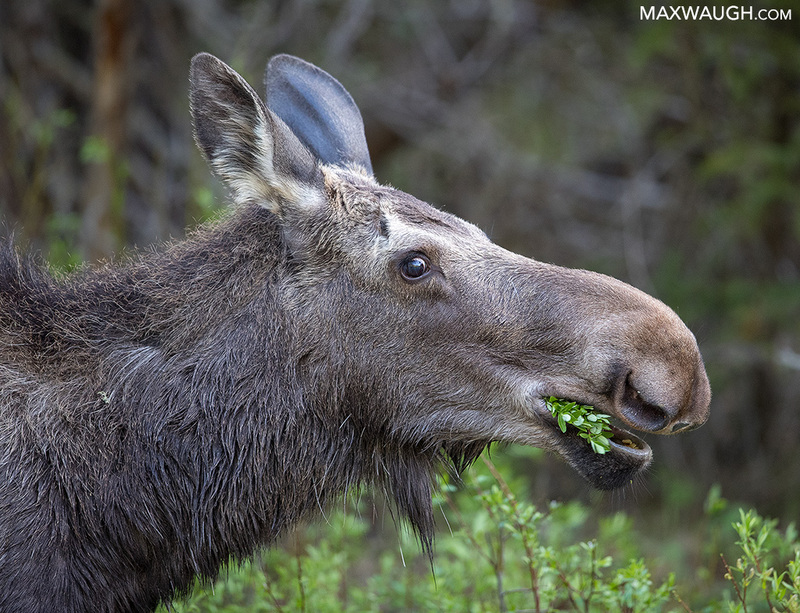 I gave my clients a heads-up to keep an eye out, and almost immediately I spotted a moose ahead of us… just as one of my clients exclaimed “baby moose!” But she was looking back where I had just passed, and the moose I saw was up ahead still. We’d ended up with more moose than we bargained for. One ahead and another behind… with two calves. Twins! Read the FINAL trip report in the blog. Thanks as always for following these reports. Thank you, Max, for another very satisfying report. Your descriptions almost make me feel as though I were there with you trying to locate the animals you find for your clients, using a bit of luck, contact information, your own natural instinct and knowledge of the park and animals. I’m looking forward to seeing more of your trip on your website once you have the opportunity to sort and process your photos. Have a good, safe drive home! Great reports Max, thanks! Fantastic photos! I almost feel like I was with you too....wait a minute, I guess I was lol. I saw you guys at Sheepeater and caught up with you again shooting the owls in Mammoth (thanks for the heads up on location and there being no Elk around, they seem very protective!) Sorry I didn't recognize you and introduce myself. That bear was definitely acting a bit off. I'll post a few pics in another thread when I get more organized. Thanks for such wonderful, detailed reports. What great experiences. I DO appreciate you sharing -- and the photos are great!